The parking lot at Sand Canyon trailhead is rough, uneven sandstone. Be careful with your low clearance vehicles. In November, many Durango locals find themselves fleeing the cold temperatures of the San Juan Mountains area in search of some solitude and warmth of the canyons in the high desert. 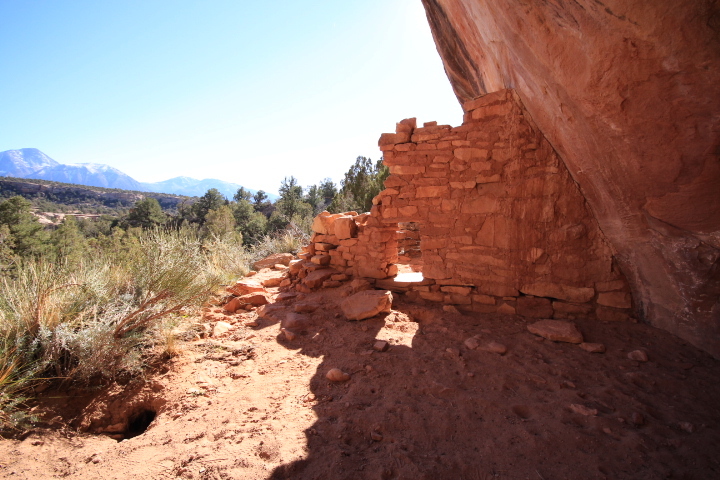 For those nomadic desert rats on the prowl, there are the trails, canyons and thousands of archaeological tribal dwellings to see at Sand Canyon just west of Cortez, Colorado. 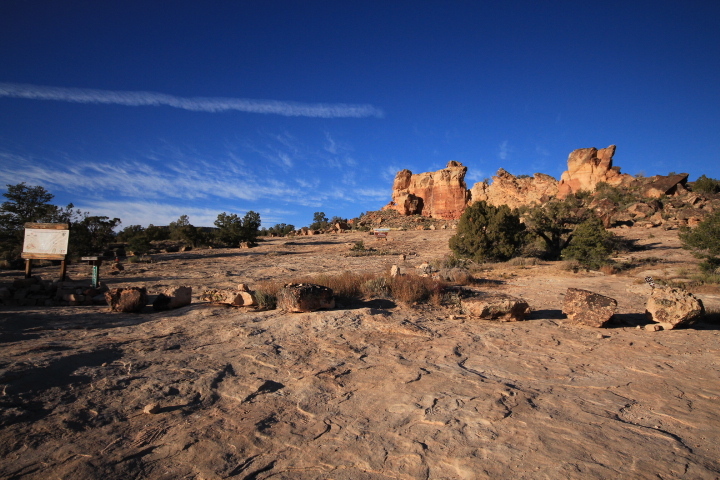 As part of Canyons of the Ancients National Monument, Sand Canyon is just an hour and fifteen minute drive from Durango. Running into McElmo Canyon, Sand Canyon’s East and West Rock Canyon Trail loops are the more secluded and primitive trails just west of the main Sand Canyon trail that sees considerably more foot traffic. 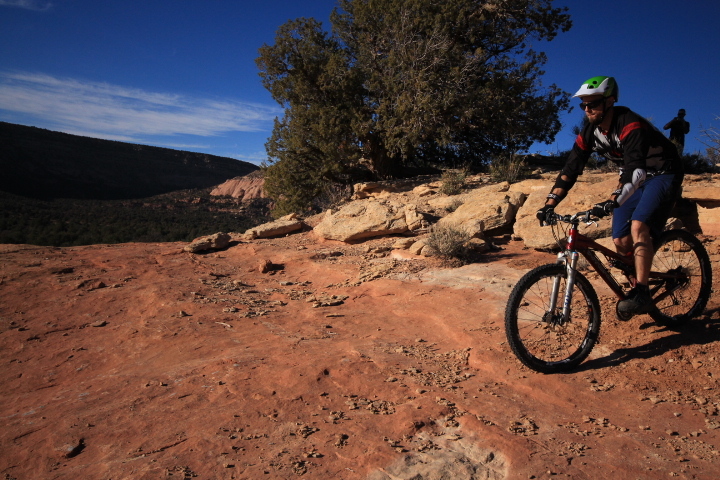 A broad sandstone face running along the lower part of Sand Canyon makes for some good times on a mountain bike. Photo by Brian Schoff. 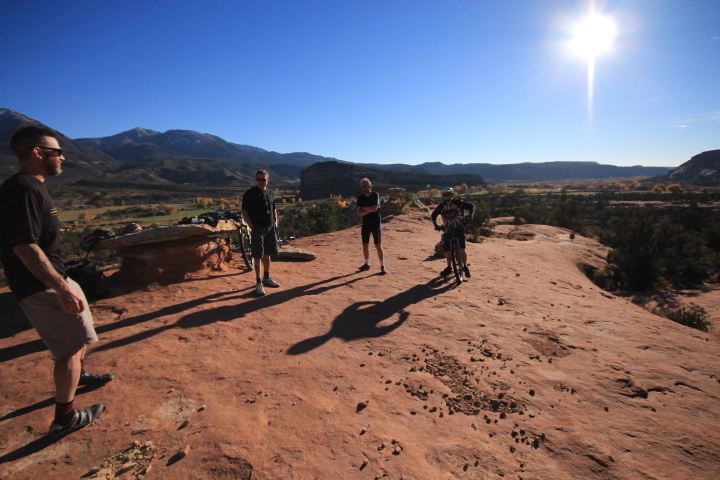 About 12.5 miles west down Road G from Cortez, the trails going up from the rough and rugged sandstone parking lot for Sand Canyon starts hikers and bikers heading up a broad sandstone face. Also starting out at the parking area is a more hoof-friendly trail through more sandy terrain for those on horse back heading up the canyons. My crew and I enjoy going counterclockwise on the East and then West Rock Creek Canyon Loops. Each loop winds its way up a shelf on the side of the canyon before crossing a drainage at the top and then heading back down on the other side of the canyon. With both sun-baked canyons having south aspects, the climate is warm, and the vegetation consists of pinon, juniper, cactus, shin daggers and various other high-desert flora. 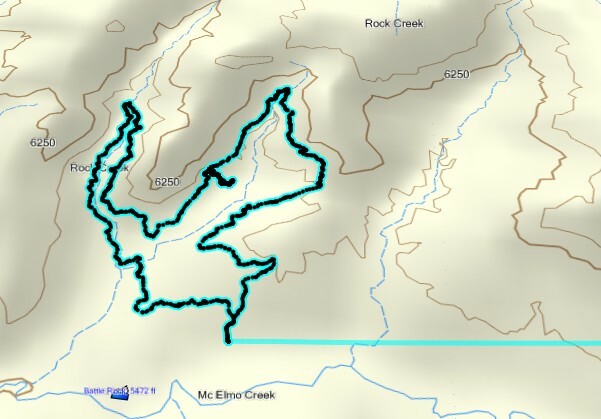 The dark loop is a track that I laid on the East and West Rock Creek Canyon loops. The main Sand Canyon Trail on the east side is not shown. At about 12 miles long for both loops combined, these trails are good for beginner to intermediate level riders, with an exit route between both loops for those wanting to do one or the other. Travel direction is discretionary; traffic direction is safe going either way. Having tons of single track and sandstone to hike, ride or bike on after you explore the canyons, this place is a primitive landscape to experience without hordes of signage at every trail head to tell you that you are not lost. Trail condition update: The single track at Sand Canyon is in good shape, but there are some sections of the trail that are overgrown with pinon, juniper, yucca and prickly pear cactus. Some of the vegetation could definitely use a little pruning. With the Bureau of Land Management being in charge of land management at Canyons of the Ancients, someone at that agency should know who is in charge of doing trail maintenance there. This blogger asked the BLM’s Public Affairs Specialist Shannon Borders, as well as the BLM’s Director of Communications Steven Hall, who was in charge of doing trail maintenance at Sand Canyon. I also asked if it was true that the BLM was considering moving the parking lot for Sand Canyon trailhead. Hall said that he did not know the answer to either question, and Borders did not respond to the questions in an email. Borders did indicate that there might not be anyone designated as an official entity or individual for doing trail maintenance at Sand Canyon. 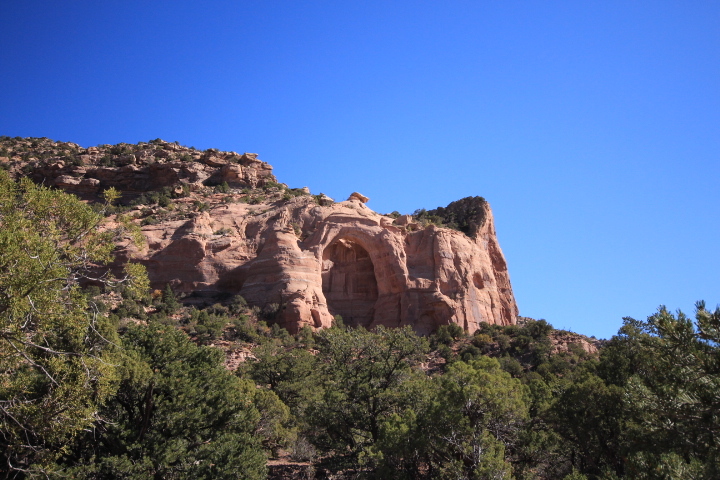 An arch in East Rock Creek Canyon at Sand Canyon. A cultural dwelling that you could find if you just looked for it. Lat long not included. A crew of riders taking a break at Sand Canyon. Photo by Brian Schoff.